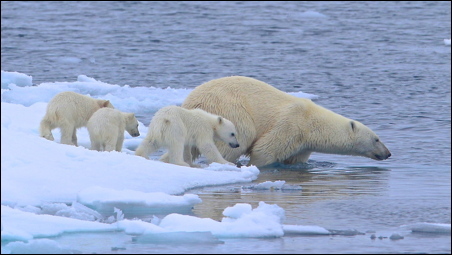 The significance of our finding a female Polar Bear on the Spitsbergen ice with three cubs did not seem that remarkable until the ships captain’s address at the end of the cruise. He told us that in twenty three years of guiding his ship through the summer pack-ice he had never seen a female Polar Bear with three cubs!! It was certainly a once in a lifetime encounter for us and whilst we only had minutes to capture the event as our ship sailed past I managed to obtain enough photos to record the event. Apparently the female Polar Bear regularly gives birth to triplets in her underground winter den but three seldom survive the harsh conditions when they emerge in March into the Arctic environment. click here.